In modern-day Jerusalem, an Arab boy and a beautiful American tourist are accidentally entrusted with a priceless coin from the age of King Herod. Soon the two are falling in love and running for their lives from Emil Saber, a man obsessed with possessing the fabled coin at any cost. Peter O’Toole is Emil Saber, a retired British soldier and collector of ancient coins and Biblical artifacts. To complete his collection of king Herod’s coins, Emil travels to Jersalem to seek out the seventh and final one. In his search for the coin, Emil beings to lose his mind and eventually believes that he is the reincarnated Herod himself. This does not go well for two teenagers who possess the coin, American tourist Ronnie and Arab pickpocket Salim. As Emil continues on his murderous rampage, the teenagers must avoid him while also protecting the coin. 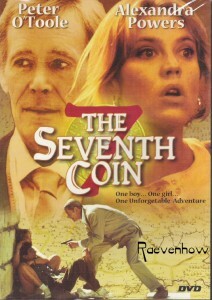 The film is filmed in Jerusalem, Israel and with the help of Paramount, The Seventh Coin became Soref’s debut as a feature film writer/director. The film won two festival awards including Best First Time Director at the Philadelphia Film Festival and the Silver Awards at Worldfest Houston.